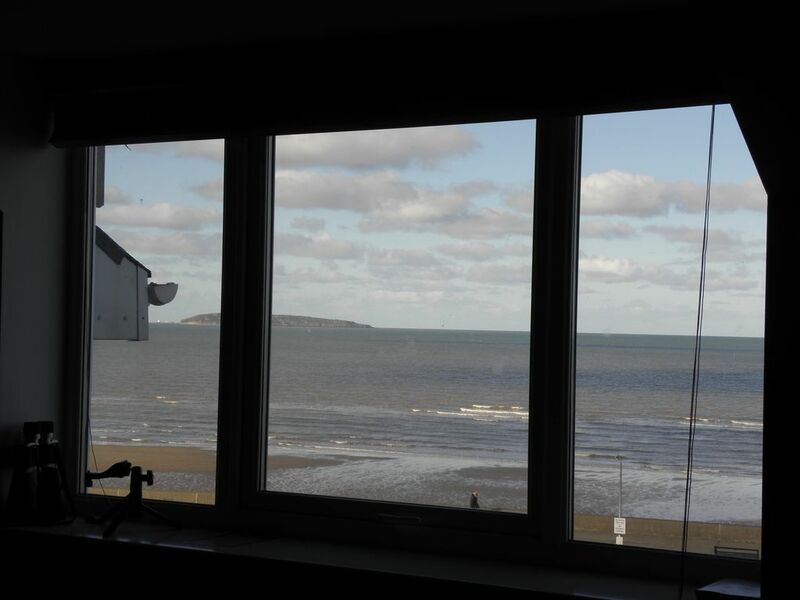 Beautiful penthouse which has spectacular views across the beach towards Anglesey, Puffin Island and the Great Orme. Recently renovated and decorated to a very high standard to ensure visitors wish to return each year. With its elevated position and closeness to the sea it will be of particular interest to those who enjoy nature. Porpoise and seals can occasionally be seen from the lounge and bedrooms along with a wealth of seabirds. Oak floors, comfortable beds, quality furniture, a fully equipped kitchen are what todays visitors demand. We also provide visitors with bikes (including a tandem) golf clubs and fishing tackle to use on their holiday (at their own risk). The apartment is perfect for four people however we do have a sofa bed and a travel cot if it is required. One very large bedroom with a super king bed, one small double bedroom without a wardrobe. Be aware there are 42 steps to the penthouse but great views await you. This is part of a residential building so please be considerate of your neighbours. We have another property here on the promenade if you have a larger party visiting and wish to book both properties. WE DO NOT ALLOW PETS OR SMOKING IN THE APARTMENT. We both retired as mental health nurses in 2010 and purchased the penthouse to supplement our pension. We enjoy traveling the world and have done so whilst we are able. Our grandchildren live in the village and keep us busy. We live in the village after moving here in 1987. The Beach Penthouse is a wonderful building overlooking the beach. As it has a oval frontage the bedrooms and lounge all have a different perspective. Also as it is the top apartment the views are so much more spectacular. There is a private drive to the rear of the property with allocated parking. Please look at the pictures as they portray the special qualities of this unique property much better than words can describe. The building is about 100 years old and has been transformed in recent years with a high quality renovation. We decided that we would purchase the very best of quality furniture knowing that if we made an effort to impress our visitors they would return and or recommend the place to friends. Beds mattresses and bedding make all the difference to a holiday. We do not believe you will be disappointed. P shaped bath with shower. WC and sink. Leather sofas seating 6. Spectacular sea views. Dishes cups plates and cutlery included. See photographs table and chairs in Kitchen/Diner. Numerous golf courses in the area. Some golf clubs maybe available for visitors. Many steps and unsuitable for the infirm. Booking Notes: Holiday Insurance, we strongly recommend you get holiday insurance. Last year two families had to cancel their holiday days before the holiday was to commence. Insurance is relatively inexpensive. Please do get cover! NO PETS. NO EXCEPTIONS. NO SMOKING ALLOWED IN THE PROPERTY. Changeover Day: We generally change over on Saturday. We like visitors to leave by 11 am and arrive after 3pm ​but this can neg​otiat​ed with us we try to accommodate our visitors whenever possible but have two apartments to prepare for visitors each Saturday. This is an exceptional ​beautiful apartment with amazing sea views. We have decorated and furnished the place with the very best. We know that visitors will rebook the following year as they will appreciate the high standard we have aimed for in our wonderful penthouse. Very nice spacious apartment with great views. Good starting place for trips up and down the coast or hiking in the mountains. Friendly hosts. Enjoyed our stay here. This was our first time using owners direct and it didnt disappoint. The place was amazing, lanfairfachen is a little gem, for such a small place lots to do and the beach is perfect for rock pooling or just relaxing! The accomodation was second to none, the views were stunning and the whole place was clean and spacious, the kitchen was great and a bonus of a washer dryer!! Also the owners were nearby for any issues and sent us plenty of recommendations of things to do!! We have loved every moment of our brrak away and have had such an amazing place to relax and rechaege. The whole process has been seamless and a fabulous experience! Cant wait to get booking again! Welcoming and good communication from property owner Ged. Property in great location and finished to a great standard. Paddling pool, tennis court all close by and nice esplanade for a walk. Glad you enjoyed your stay Jose. Thank you for your positive review of our apartment.Glad you all enjoyed your stay. We loved our stay in Llanfairfechan! It is a beautiful seaside village, so peaceful and relaxing. With rail and bus stations in easy walking distance we were able to enjoy some of the amazing adventures North Wales has to offer. Ged was so welcoming and helpful. He showed us around, recommended places for groceries and restaurants, and carried my bag up the three flights of stairs. He is a gem! While the stairs give you a bit of a workout, the views from the penthouse are well worth the effort. If you are looking for a home base from which to explore the region, I doubt you'll find better than this property. Llanfairfechan has a number of shops for basic supplies an ATM three public houses a golf and sailing club. There are also a number of cafes in the village.Two small supermarkets. Various shops cafes. We have found a number of first class restaurants nearby and must mention them to you. Places to eat and drink nearby. A trip up into Snowdonia may take you past a lovely bit of history associated with the first accent of Mt Everest. Please call to see Pen-y-Gwyrd http://www.pyg.co.uk Set the NavSat to LL554NT Tel 01286870211. Voted the best pub in Wales in 2013 We visit the Albion in Conwy too often. Our visits are made more convenient by the return fare on the train from less than £4 each from Llanfairfechan train station. (300 meters away) Ariva Buses do a day and weekly pass. Sailing golf walking climbing bird watching cycling fishing are all popular activities along with surfing and mountain biking. Llanfairfechan is ideally placed for touring North Wales. We are at the gateway to the Snowdonia National Park. Our coastal location is 13 miles from Bangor and 13 miles to Llandudno. Anglesey’s 125 mile coastal path will keep you busy. The apartment is available from June to mid September and offers accommodation for four people. Climbers will value the comfort of a warm homely place to rest after a day on the mountains. New things you must do! Zipwire See http://www.zipworld.co.uk/ the longest zip wire in europe zip world ... is located in the most dramatic of settings – Penrhyn Quarry which is nestled amongst the mountains of north Wales One mile long you travel at 100mph. Remember not to where white trousers! NO PETS OR SMOKING IN THE APARTMENT. There are thirty plus steps up to the apartment please do not book if you would find this difficult. To the rear of the property is car parking. Please leave the property as you found it. WE STRONGLY RECOMMEND THAT YOU GET HOLIDAY INSURANCE PRIOR TO BOOKING YOUR HOLIDAY. Do feel free to contact us at any point. It is our intension to ensure you have an enjoyable holiday and choose to return again. Booking Notes: Holiday Insurance, we strongly recommend you get holiday insurance. Last year two families had to cancel their holiday days before the holiday was to commence. Insurance is relatively inexpensive. Please do get cover! NO PETS. NO EXCEPTIONS. NO SMOKING ALLOWED IN THE PROPERTY.. Changeover Day: We generally change over on Saturday. We like visitors to leave by 11 am and arrive after 3pm but again this can negotiated with us. We try to accommodate our visitors whenever possible. We have two apartments to prepare for visitors each Saturday.